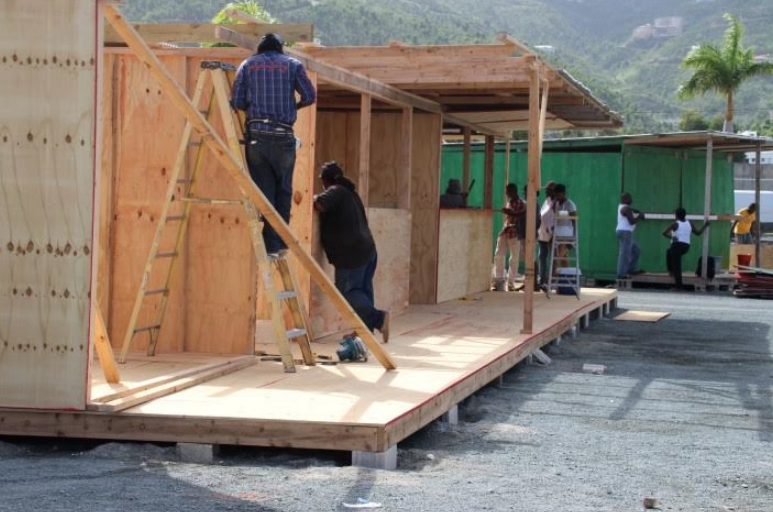 Booths being constructed at the festival village in Road Town. Patrons planning to attend the annual emancipation celebrations this year are being told to expect fewer food and beverage options at the festival village in Road Town. Vice Chair of the VI Festivals and Fairs Committee (VIFFC) Xayrna Samuels told BVI News there are at least five fewer booths this year. “We have a total of 17 booths, 15 of which are sale booths. The other two will be for the [VIFF] committee and the other one is for the police,” she said. Samuels said there are reasons behind the reduced numbers. She said many of the booth owners would recycle their building materials. However, due to the hurricanes, it was destroyed. “A lot of them really couldn’t put their selves in the expense of getting new materials for this year,” she continued. She further said all of the booth owners who will be in operation this year are those who have been on the grounds religiously year after year. Samuels also mentioned changes to the usual layout inside the festival village this year. Samuels said in order to accommodate the fewer number of booths, the VIFFC decided to ‘try something new’. The stage is no longer positioned in a central location, but it is now located towards the back near the mangroves. Notably, the amusement rides will be available for the festival, she said. Importantly, vendors will only be charged $500 to set up booths at the festival village this year. The figure represents a 50 percent reduction when compared to previous years. The festival village officially opens on Friday, August 3. Due to the lingering impacts of the 2017 hurricanes this year’s festivities have been significantly scaled back. Several gospel artistes are down to perform at gospel festival scheduled for Thursday night. Among the artistes are Gabrielle Denae, High-Frequency Band VI, New Level Praise, Joy Praise, Oneyke, Chiomzy and Kendra Penn. The event begins at 7pm and there is no admission fee. The Virgin Islands Heritage Month Committee is presenting the gospel fest this year. There was absolutely no consideration given to the many persons living on the surrounding hills. Noise, Noise, Noise. Shouldn’t of have festival period point blanket!! exactly. How fast they building wooden structures for drinking but some old shipping container as a ferry dock. So bad. @Wow. Put a sox in your mouth and go back under your rock for heaven sake. Why not half price at the gate too? The Festival will not cover its costs this year, just like every year. The ticket price is too high for what you get. Festival and Parade could be a massive tourist draw if some more thought was put into it. Better scheduling, better booths, better food (sorry but the food isnt great and there isnt any variety). A little creativity would be great: story-telling of folk-lore of the islands for kids; literature festival of Caribbean artists with book readings and interviews; international art prize & exhibition for art of the Caribbean/BVI; cook-out competition for best funghi, fry-fish; demonstration of local traditional craft skills (hat-making, basket-weaving);car-show etc etc. There is a way to make us celebrate the past and the current culture of the BVI, we dont just need to do the same thing we did last year, and the year before last. How about hosting in the lot by the Pier Park so that people can enjoy that facility (and restrooms)? The Festival Village is one of the most unattractive places in the whole of these beautiful islands, those restrooms are gross. Participation in Festival is low: locals, expats, tourists. Hardly anyone takes part. Its because it just isn’t that good. People travel, people have tv, internet. Their expectations are much higher than in the old days. I support the spending of the money and the importance of celebrating the Emancipation but only if it is something where there is widespread participation and which acts as an economic driver more generally. Better to take that $750,000 and divide up that money to every child, woman and man who is a Belonger and let them spend it how they choose than carry on with the current program of events. This thing doesn’t know what it is. When nonbelongers including tourist take part in numbers “dey taking over our culture” and when they don’t “dey not integrating in society and doing their bit for the community”. It’s never clear what is happening where and when other than the headline “music” acts. Then there’s always the split of those that say it is all about Dutty wine and not about emancipation while others argue the celebrations express our freedom. Either way, kids are exposed to sexually aggressive filth which they inherit or stay away. Big artists from abroad then it’s selling out on our own, no big artists from abroad and there’s not enough of a draw to get people out. The mood is rarely jouyous, inclusive or celebratory or reverent. Maybe rebuild a committee with a view to making sure the biggest event of the year is enjoyable, inclusive, culturally enriching and positive for BVI financially and spiritually.